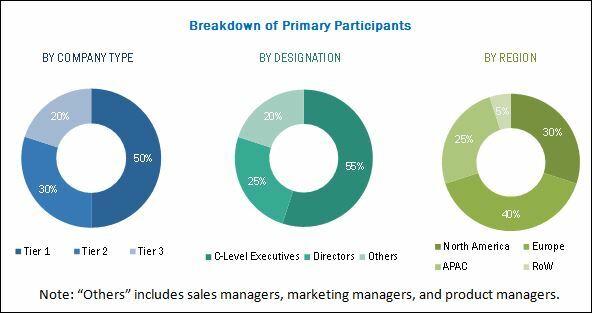 [134 Pages Report] The vertical lift module (VLM) market is expected to grow from USD 987.3 Million in 2017 to reach USD 1,679.6 Million by 2023, at a CAGR of 9.3% between 2018 and 2023. The base year considered for the study is 2017, and the forecast period is between 2018 and 2023. There has been an increase in the adoption of VLMs in various industries such as semiconductor and electronics, aviation, healthcare, and automotive. Various trade shows and expos have also helped VLM manufacturing companies to expand their customer base and contribute significantly to the growth of the VLM market. For instance, LogiMAT 2016, an event held in Stuttgart, Germany, from 8 to 10 March 2016, served as a good platform for many companies to showcase their innovative technologies and products. EffiMat Storage Technology exhibited EffiMat VLMs for handling and storing small parts that can move 5 containers vertically as well as horizontally. Further, a trade show named CEMAT 2016 was held between 31 May and 3 June 2016 in Hanover, Germany. In this trade show, Haenel demonstrated its intra-logistics concept and exhibited its Lean-Lift VLMs. The objective of the report is to provide a detailed analysis of the VLM market based on delivery type, storage type, industry, and geography. The report provides detailed information regarding the major factors influencing the growth of the VLM market. The report also gives a detailed overview of the VLM value chain and analyzes the market trends. The VLM ecosystem comprises system manufacturers, integrators, software providers, and distributors. The players involved in the manufacturing of VLM include Kardex (Switzerland), Haenel (Germany), System Spa (Italy), Ferretto (Italy), ICAM S.r.l. (Italy), Toyota Industries (Japan), AutoCrib (US), Automha (Italy), Constructor Group (Norway), Conveyor Handling Company (US), Green Automated Solutions (US), Lista (Switzerland), Mecalux (Spain), Stanley Vidmar (US), and Weland Lagersystem AB (Sweden). 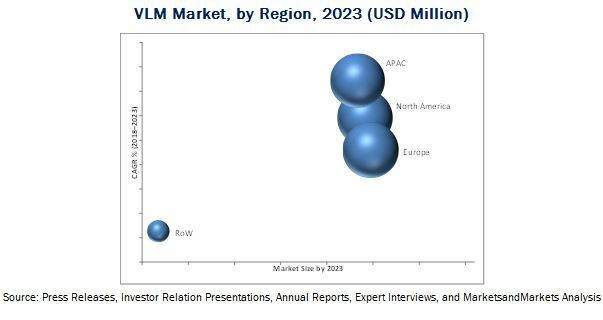 This research report segments the overall VLM market on the basis of delivery type, storage type, industry, and region. With the given market data, MarketsandMarkets offers customizations according to the companies’ specific needs. The following customization options are available for the report. The vertical lift module (VLM) market is expected to grow from USD 1,074.6 Million in 2018 to USD 1,679.6 Million by 2023, at a CAGR of 9.3% between 2018 and 2023. Key drivers for the growth of the VLM market include growing need to optimize warehouse floor space, benefits of deploying VLMs compared to standard shelving systems, rising warehouse rentals, and increasing focus on worker safety and security. Single-level delivery held a larger share of the VLM market in 2017. Factors such as growing demand for faster storage and retrieval of heterogeneous goods, and need for maximum storage space utilization are driving the growth of VLM market for single-level delivery. The rapid industrialization of emerging Asian economies, such China, India, and Vietnam; growing e-commerce industry; and increasing need for automated warehousing operations are the key factors fueling the demand for single-level delivery type VLMs. Non-refrigerated storage accounted for a larger market size of the overall VLM market in 2017. Some of the leading manufacturing industries including automotive, metals and heavy machinery, semiconductors and electronics, and aviation use non-refrigerated VLMs for the storage and retrieval of components and raw materials. Non-refrigerated VLM is the best choice for these manufacturing industries as raw materials used in these industries are not susceptible to temperature change. Automotive suppliers have made rapid progress in the automotive industry by offering innovative products based on new technologies and enabling real-time information to offer excellent order fulfillment in terms of efficient product delivery and quality. These suppliers continuously focus on managing a large quantity of goods effectively. They also seek to reduce the additional costs incurred due to damages in auto parts and unproductive labor hours spent in handling inventory. These suppliers intend to improve the storage capacity within the available floor space. These factors lead to the increase in adoption of VLMs in the automotive industry. Europe held the largest share of the VLM market in 2017. The emphasis of various players on different events to promote the launch of new products, advancements in technologies, and need to optimize warehouse space are some of the main factors driving the demand for VLMs in Europe. This region has always been an important market for innovative technologies. Europe presents vast opportunities for the growth of the VLM market. Industries such as automotive, aviation, chemicals, healthcare, and food and beverages in Europe have witnessed an increased number of VLM installations. The VLM market in APAC is expected to grow at the highest CAGR during the forecast period. Key factors such as growing automotive, and semiconductor and electronics industries; shortage of warehousing space; and huge growth potential for automated material handling systems contribute to the growth of the VLM market in APAC. The easy availability of used VMLs at economical pricing is a key restraint of the market. A new VLM would cost around USD 45,000–90,000. However, the cost of used VLM is much lesser than this, i.e., ~USD 25,000–40,000. The availability of such used VLMs encourages small and medium-sized enterprises to adopt these vertical lifts without spending much over the capital expenditure. Kardex (Switzerland), Haenel (Germany), System Spa (Italy), Ferretto (Italy), and ICAM S.r.l. (Italy) are the top VLM manufacturing companies in the market. These companies focus on product launches and developments, expansions, and partnerships strategies to enhance their product and service offerings, and expand their business globally. *Details on Business Overview, Products and Services Offered, Recent Developments, SWOT Analysis & MnM View Might Not Be Captured in Case of Unlisted Companies.